I need to get both front and rear wheels off the ground so i can change the tires . 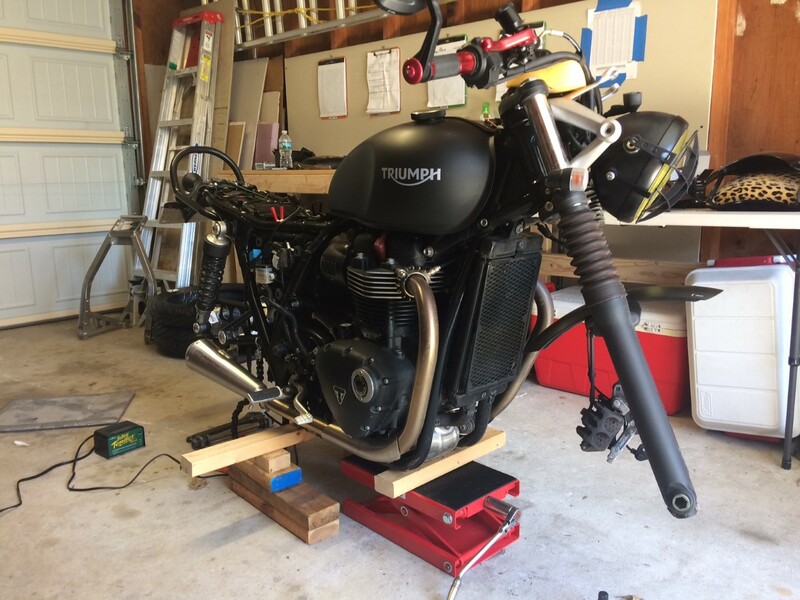 i got one of those motorcycle scissor lifts with the nice flat pad to fit under the bike , i,m just paranoid if i where to lift it from under the oil pan or if i should make up some wood support to lift it by the frame on either side . . do you or does anyone know if the oil pan can take the load . thanks. No no no do not jack on the oil pan, jack on the frame only the oil pan is only light metal and you will damage it with a jack and weight of your bike, my sissor jack has adjustable arms that can slide and arms that sit on the frame, with my sissor jack can only lift one wheel at a time, some motorcycle jacks will lift both wheel but the sissor jack only one wheel is best at the time but if yours don't have the adjustable arms and only the flat top it will still be able to jack up and sit on the frame or you can use timber surports as well. It could lift both wheels up if you want but your bike will be very unstable so best to do one wheel at a time, safer that way and is how the sissor jack works, I don't think I like my bike to fall off wihtout bothe wheels on. Last edited by Ashman; 04-10-2019 at 06:05 PM. Do one wheel at a time. Jack the rear under the tabs for the centre stand. Jack the front under the catalytic converter - remove the heat shield first and everything will be ok. Done it myself twice. You can make a frame that rests on the frame rails with no contact with the alloy pan of the engine. tks folks, i figured it isent a good idea to apply pressure to the pan , although it appears to be more solid then it looks . will be cutting some 2 by 4 to lift by the frame. Putting the flat top scissor jack under the tabs for the centre stand to raise the back wheel sounds good. Looking for a place to place the jack for the front wheel reveals two tabs just behind the forward bend in the frame tubes. These tabs are used to fit the accessory sump protector plate and may or may not take the force needed to lift the front of the bike. It's hard to get the flat top of the jack under the frame tubes without catching these tabs (in the forward position) or the body of the cat converter if placed slightly more rearward. 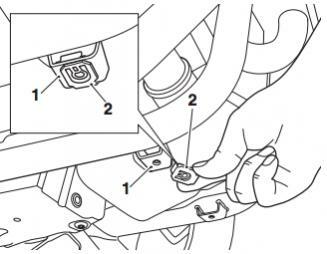 Is it ok to jack up the front of the bike with these tabs taking a good part of the weight? Failing that, some type of timber spacer would need to be made to align with the frame tubes, but I see adding spacers would reduce safety and stability of the raised bike unless carefully designed and accurately positioned. Line drawing of the tabs attached. Remove the heat shield from the cat, place a soft 1 x 4 piece of wood on top of the scissors jack and lift directly under the cat. Very stable. No, those tabs are, as you mentioned, for mounting a 1/2 pound sheet of aluminum, not for jacking up the bike. Your idea to put a piece of wood between the jack and the frame is the best idea. Use a 2x4 or something of similar size and lay it across the rails. Alternatively, invest in padock stands.